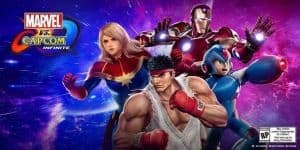 Marvel vs. Capcom: Infinite Adds Four Characters | Nerd Much? Capcom did not release any photos or a proper release date. Marvel vs. Capcom: Infinite launches September 19, 2017 and the game already has four DLC characters that will be added later in the year. These characters will not be included in the standard edition unless you pre-ordered the game. At that point it has been confirmed that Infinite will come with four character costumes called Warrior Thor, Evil Ryu, Gladiator Hulk, and Command Mission X. The four new characters are Monster Hunter (a version of the player character), Winter Soldier, Black Widow, and Venom. Capcom did not release any photos or a proper release date. The year is coming to a close however, so it shouldn’t be too much longer. That and I imagine most larger companies are already planning the marketing for the holiday season. It’s sure to be a big one, as always, if Capcom plans on keeping more DLCs for later on. The publisher implies that the characters are still in development, so hopefully we’ll at least get some screenshots soon. Marvel vs. Capcom: Infinite is a fighter game that features two player team battles, instead of the three that the rest of the series had. Each character on the roster will have some kind of special combo that can be done together with the other player. Infinite is also the first time we will see the Infinity Stone mechanic, which gives each character a unique set of abilities and higher stats, depending on the stone chosen. Thus far, it seems like this is the kind of action that can make or break a battle. We will have to wait and see how truly balanced it is, or if it is an over-powered tool. Capcom also boasts that Infinite will have far more story and plot that previous games. There will be a cinematic mode available for those players who are interested. The goal, in the end regardless of the mode, is to make sure both universes work together and take down Ultron Sigma. Marvel vs. Capcom: Infinite comes out on the PS4, Xbox One, and PC.